Penglais Campus – the new Vision? The justification allegedly was Health and Safety – the installation of railings at the top of the drop at the back of the border, a drop which at the Llandinam end was a mere 18 inches, but at the the other end about twelve feet. Last week I revisited to see the completed works. The border has now been replaced by a stunningly green sward of new turf. This green desert monoculture looks a bit unexpected doesn’t it? Gardeners know that this bright green turf will soon lose its lustre in the shade of evergreen trees. Ecologists know that while a species-diverse grassy meadow is an asset, new uniform turf is little more desirable than astroturf. The tragedy is that this expensive form of re-instatement is only the briefest of fixes, a decision which would only have been taken (and was) by Estates Department staff totally unqualified and unversed in horticulture. The fear is that, chagrined at the consequences, those same decision-makers will then cut down the remaining trees to save the new grass! I don’t believe this was the kind of greening that they had in mind. 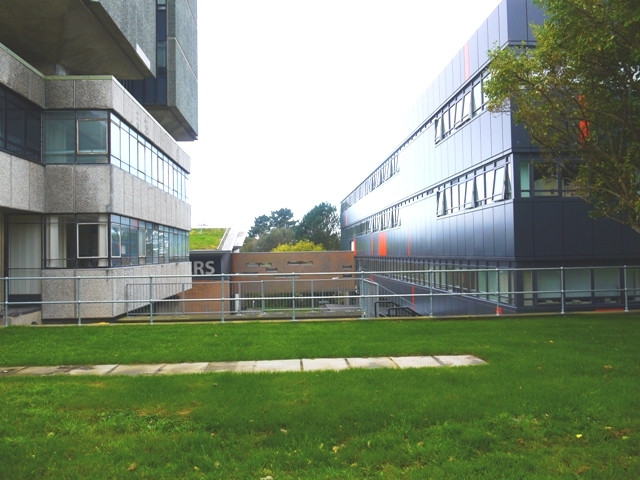 As for their health and safety, the new railings are just two horizontal rails, of the sort that many a drunk student has vaulted over for fun. Where the drop was protected by a hedge of shrubs it was far less accessible. The foreground view through to the IBERS building is now just a mish-mash of different generations of fence, and a paved path to nowhere. 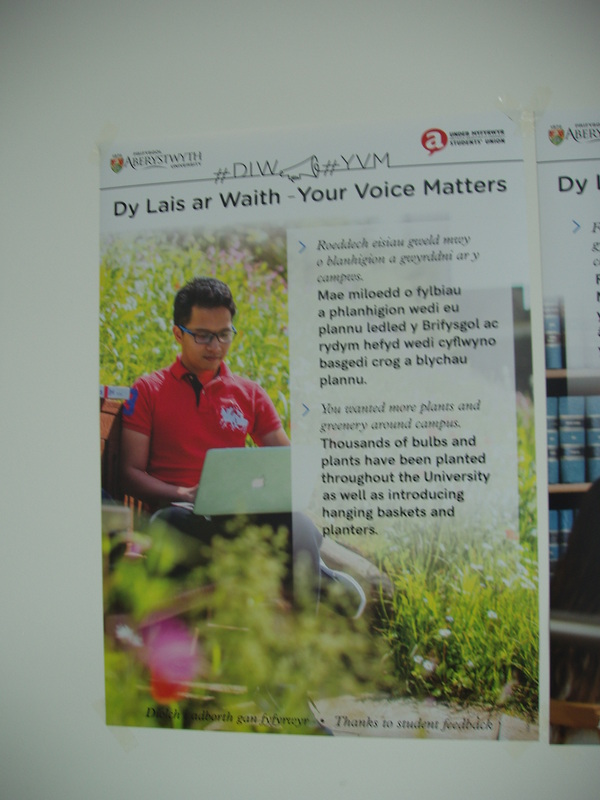 At the same time a new self-congratulatory PR poster aimed at students has appeared in University buildings. The students may have asked ‘more plants’ but they are not getting them – unless we count the individual seedlings of grass! They aren’t getting ‘more greenery’ either. Did the students specifically ask for hanging baskets? ( the ones who signed the petition I saw certainly did not). And did they ask for them to be spread randomly around the grounds? Playing spot-the-hanging-bracket might become a new student activity. A lone bracket has been affixed to the elegant timber facade of the IBERS building. Another sticks out adjoining the steps to the Arts Centre and Students Union. Yet another is screwed high on the wall at the entrance to Geography and Earth Sciences. While a hanging basket gives a quick fix to a suburban patio a large landscape need a far more considered approach and on a practical level, watering these floral displays is going to be quite a challenge. We have seen other phases of expensive and impractical gimmickry come and go. 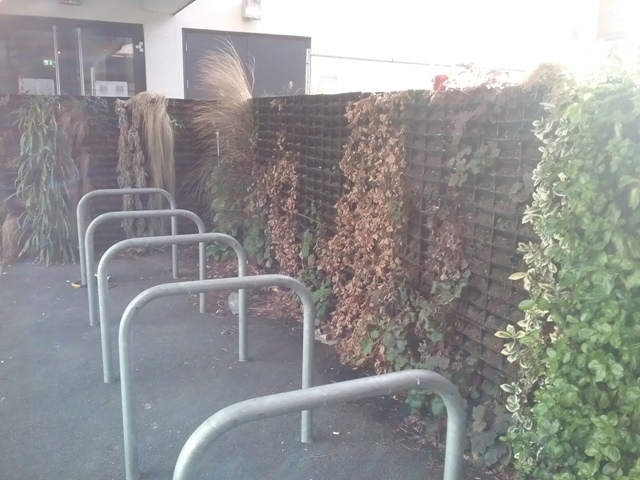 The IBERS green wall, for example, has been quite rightly cleared away, for it soon looked like an abandoned garden-centre sales area on end! 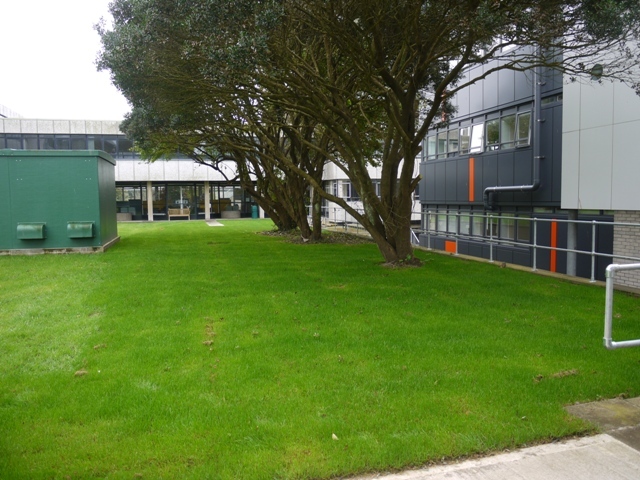 One of the current public enthusiasms, quite rightly, is Bee Friendly Landscapes, I believe that Aber students have already formed a bee-friendly group. Woodchip, monocultures of turf and the occasional hanging basket are not bee-friendly. That extensive bank of flowering cotoneasters below the Hugh Owen Building most certainly was! There is no landscape expertise guiding the recent changes on campus. Buildings Maintenance, Health and Safety, Disability Access, Controlled Parking and other pressures all chip away at the carefully designed plantings which earned Aberystwyth University its Cadw Grade II* listing. Soon there may be very little left to justify that accolade. 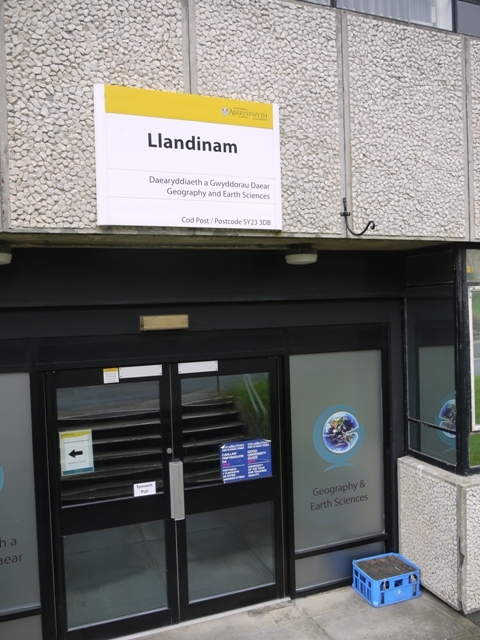 This entry was posted in Ceredigion present, Natural history, Parks and Gardens and tagged Aberystwyth University, Penglais campus by Curious Scribbler. Bookmark the permalink. We used to visit for holidays as a family and once met Basil Fox. I don’t think I want to ever see the place again. Total and unnecessary desecration. Yes, these changes to the campus are very regrettable and unfathomable.Health and safety explanations just don’t add up. Aberystwyth is hoping to go for Bee Friendly status and the recent cutting of part of the wild flower meadow is a step in completely the wrong direction. We have so much expertise on our doorstep why in the world aren’t we consulting with the right people to maintain the campus in its true glory before it’s too late. Is there a subplot here that we are missing? As someone who works on the campus most days of the week I think it looks a lot tidier and probably needs less expensive maintenance .Having loads of plants everywhere does need a workforce to look after them.Careful thought is required as to what type of plants are required in the future – it did get to look a little overgrown in the past.The University is making good progress with removal of some trees.If you look down from the Arts Centre in the direction of the town the view has been very much obscured. “probably less expensive” is a big assumption. New grass on steep slopes and deep shade will require a lot of care. The shrub plantings, so integral to the original design were very low maintenance. What does “the university is making good progress with removal of some trees ” mean ? That it would make even better progress if even more went? Everywhere the research is to plant more trees for our health both physical and mental. In general l agree with the criticism of the recent changes but l think the spring/summer planting of the bank below Hugh Owen is succeessful, just not finished. IMO all these measures are to do with ease of maintenance and therefore less staff. It is bizarre that a university with a wealth of knowledge about bio diversity and what to plant where are wrecking one of the major assets of the campus. There used to be adherence to what was called the ‘green finger’ which is now becoming the green monoculture.